You hear heavy footsteps in the upstairs hallway when you know no one is up there. Doors slam unaccountably. Commonly used items disappear and reappear without cause. The kitchen light turns on by itself. There's the unmistakable scent of a strange perfume in the air.These may be indications that your house is haunted. True hauntings are rare occurrences, and it may be difficult to determine whether or not any strange phenomena you are experiencing in your home might be due to a haunting. For one thing, no one really knows what a "real" haunting is - what causes it or why it starts. There are many theories, of course, which we have discussed in this space in the article "Ghosts: What Are They?" But if you think your house may really be haunted, what can you do about it? Considering all of the above, if you suspect your house is indeed haunted, In traditional belief and fiction, a ghost is the soul or spirit of a deceased person or animal that can appear, in visible form or other manifestation, to the living. 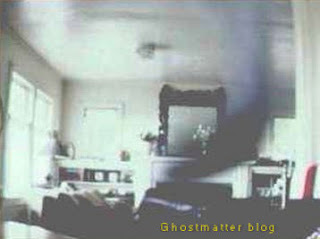 Descriptions of the apparition of ghosts vary widely from an invisible presence to translucent or barely visible wispy shapes, to realistic, life-like visions. The deliberate attempt to contact the spirit of a deceased person is known as necromancy, or in spiritism as a séance. The belief in manifestations of the spirits of the dead is widespread, dating back to animism or ancestor worship in pre-literate cultures. Certain religious practices—funeral rites, exorcisms, and some practices of spiritualism and ritual magic—are specifically designed to appease the spirits of the dead. Ghosts are generally described as solitary essences that haunt particular locations, objects, or people they were associated with in life, though stories of phantom armies, ghost trains, phantom ships, and even ghost animals have also been recounted. The English word ghost continues Old English gást, from a hypothetical Common Germanic *gaistaz. It is common to West Germanic, but lacking in North and East Germanic (the equivalent word in Gothic is ahma, Old Norse has andi m., önd f.). The pre-Germanic form was *ghoisdo-s, apparently from a root denoting "fury, anger" reflected in Old Norse geisa "to rage". The Germanic word is recorded as masculine only, but likely continues a neuter s-stem. The original meaning of the Germanic word would thus have been an animating principle of the mind, in particular capable of excitation and fury (compare óðr). In Germanic paganism, "Germanic Mercury", and the later Odin, was at the same time the conductor of the dead and the "lord of fury" leading the Wild Hunt. Besides denoting the human spirit or soul, both of the living and the deceased, the Old English word is used as a synonym of Latin spiritus also in the meaning of "breath" or "blast" from the earliest attestations (9th century). It could also denote any good or evil spirit, i.e. angels and demons; the Anglo-Saxon gospel refers to the demonic possession of Matthew 12:43 as se unclæna gast. Also from the Old English period, the word could denote the spirit of God, viz. the "Holy Ghost". The now prevailing sense of "the soul of a deceased person, spoken of as appearing in a visible form" only emerges in Middle English (14th century). The modern noun does, however, retain a wider field of application, extending on one hand to "soul", "spirit", "vital principle", "mind" or "psyche", the seat of feeling, thought and moral judgement; on the other hand used figuratively of any shadowy outline, fuzzy or unsubstantial image, in optics, photography and cinematography especially a flare, secondary image or spurious signal. The synonym spook is a Dutch loanword, akin to Low German spôk (of uncertain etymology); it entered the English language via the United States in the 19th century. Alternative words in modern usage include spectre (from Latin spectrum), the Scottish wraith (of obscure origin), phantom (via French ultimately from Greek phantasma, compare fantasy) and apparition. The term shade in classical mythology translates Greek σκιά, or Latin umbra, in reference to the notion of spirits in the Greek underworld. "Haint" is a synonym for ghost used in regional English of the southern United States, and the "haint tale" is a common feature of southern oral and literary tradition. The term poltergeist is a German word, literally a "noisy ghost", for a spirit said to manifest itself by invisibly moving and influencing objects. Wraith is a Scottish dialectal word for "ghost", "spectre" or "apparition". It came to be used in Scottish Romanticist literature, and acquired the more general or figurative sense of "portent" or "omen". In 18th- to 19th-century Scottish literature, it was also applied to aquatic spirits. The word has no commonly accepted etymology; OED notes "of obscure origin" only. An association with the verb writhe was the etymology favored by J. R. R. Tolkien. Tolkien's use of the word in the naming of the creatures known as the Ringwraiths has influenced later usage in fantasy literature. Bogie is an Ulster Scots term for a ghost, and appears in Scottish poet John Mayne's Hallowe'en in 1780. A revenant is a deceased person returning from the dead to haunt the living, either as a disembodied ghost or alternatively as an animated ("undead") corpse. Also related is the concept of a fetch, the visible ghost or spirit of a person yet alive.Traditional apparitions are ghosts that interact with human beings. This can be for good or for bad. These ghosts are said to hide objects, frighten people, throw objects or plea for help. These ghosts are said to be present because of unfinished work. This can be due to their death in untoward circumstances, and they generally seek human help to resolve the issue and progress into a different realm. These spirits are said to be “intelligent” yet haunting, as they appear to be aware of the people around them and their surroundings. Crisis apparitions are ghosts who appear to inform someone about danger. They are solid or transparent by nature. Anniversary ghosts appear on the anniversary of their death caused by some tragic event. These ghosts are commonly found in haunted houses or castles, and often relate to legends of tragedies from centuries past. Messenger ghosts, like banshees, appear to family members to herald the death of another family member. Poltergeists are noisy spirits who produce sounds like ""psychic explosions"" from a teenage boy or girl. Speculations are believed to be the soul or spirit of humans who have passed on from this life. These are orb-shaped and have been seen by many. Some say these spirits have a separate life form and are undetectable to the human eye because of their finer tissue. Although there has been a lot written about ghosts, nothing can be termed as reality. Scientists still believe that ghosts and spirit is something that has been born out of the fear of human. - The ability to leave one's body and travel in spirit to another location. Alien - Alien (ET) is life that exists on earth and originates outside the planet Earth. Alien Grave Mountain - The only place in the universe currently known to support alien life, Located in southern Kentucky over one of the largest cave systems in the world. Hostile Reptilian Area! Alien Grave Mountain is closed to the public for your protection. There is nothing good comes out of the woods of Alien Mountain Its been deemed not safe!! They are unknown forces that inhabit the area today. Appalachian - See Reptilian Humanoid. Apport-The arrival of object during a séance or a haunting, these can be animate or inanimate. Archangel Raphael-Definition The word "Raphael" means "God has healed" Angelic Healing by Archangel Raphael and his legions of healing Angels bring healing into wholeness for body, mind, spirit, soul and relationships. He is also known as the chief of the guardian angels.Raphael gave Noah a much-prized 'medical book' after the flood. There's a legend that when Solomon prayed to God for aid in building the great temple in Jerusalem, Raphael personally delivered the power to subdue all demons. It was with this 'labor' that Solomon the Hebrew king completed the construction. Astro Theology The name Astro Theology is for the branch of theology which reflects upon extraterrestrial life, both biologically simple and intelligent. Astro theology is used in the context of ancient and modern scholars toward the discovery of the original religion.. Astro Theology pre-dates all other religions by thousands of years. Astro Theologian (Pontifex Maximus) - Ancient Priesthood: Keeper of the science of religion and Celestial records.. Effusion of Parallel Universe Wisdom..Hidden knowledge of the Paranormal..Ponders the meaning of upheavals on Earth, UFO,s Extraterrestrials in the Cosmos, and a modern day expert on Biblical celestial references. Aura Reading -The ability to see the energy fields that emanate from living beings. Psychic ability can often reveal itself throught the seeing of auras. - Phenomena by which people write without conscious thought. Automatism-A process in which the subconscious communicates with the conscious by means of a vehicle such as a Ouija Board, automatic writing, or pendulum swinging. - These are ghosts that call out the name of the living in order to get their attention. - Someone with the psychic ability to see events or people which have not occurred yet. Usually confused with Precognition, this ability actually has much more in common with "Remote Viewing", True clairvoyance is not the abilitly to see into the future, but the psychic ability to see visions of that which is hidden or far away. Cold Spot- An area where the temperature is lower than the surrounding environment. Cold spots are believed to be created when a ghost is presence within that area. Collective Apparition –An apparition seen by several people at the same time. Day Ridge Quarry - An Early Pennsylvanian 310 million year old tetrapod trackway,was found in the Lee Formation at the Day Ridge Quarry on the Nevelsville road in McCreary County, Kentucky. Terrestrial characteristics of the trackway, such as digit length, claw marks, gait, and tail drag, suggest that it was made by a member of the reptilian family Protorothyrididae. This is the oldest known reptile trackway in North America. The repoid tracks are elongated and slender, and the long toes indicate a terrestrial form, the gait was more advanced than the sprawling gait typical of the most primitive tetrapods. Deep Trace Medium -A psychic who allows a spirit to enter their body so that the spirits can communicate through them. -Also known as "water witching", dowsing involves the use of a rod, sticks, or pendulum to locate water or lost objects. - A substance that emanates from a medium during a trance. It often appears as a mist-like or vapor substance. It can be seen moving, often faces and other forms can been seen in it. Empathy - Someone who shows considerable empathy psychically. The talent to sense the needs, drives, and emotions of another. As with Aura Reading, psychic ability can often reveal itself through the development of empathy. ETI Observatory -A system for detecting extraterrestrial intelligence civilization located on Alien Grave Drive. Life forms originating on planets other than our own. Extra Sensory Perception (E.S.P.) - The ability to receive information about past, present or future events that can not be obtained through the normal senses. These include telepathy, clairvoyance and precognition. Faerie Fire - Faerie Fire: A green light or energy that glows but does not burn, often seen in enchanted places at night. Its the veiled space between the physical realm and the world of spirt. It's possible to enter this realm in a physical state, and often you will 'lose time' in this space. When we subconsciously slide into this realm we often catch glimpses of life in other dimensions. Ghost - A ghost is believed to be the soul or the life force of a person. Humanoid -"humanoid" refers to any being whose body structure resembles that of a human, as well as mythological creatures, aliens and robots. -Similar to clairsentience, this is the power or faculty of attaining direct knowledge or cognition without rational thought or inference. Interdimensional -unidentified flying objects (UFOs),related events, these phenomena are visitations from other universes or dimensions that coexist separately alongside our own. Is a modern manifestation of entities or phenomena which have appeared throughout and possibly before recorded history, and was explained as mythological or supernatural creatures..
Kentucky Vortex - The power energy point at alien grave mountain is where the last visibile active vortex sighting was fifty years ago with a mysterious light display. Now they are yearly paranormal activities with portals opening into other worlds. The swirling energy of time/space distortions phenomenon area is monitored by webcams..
Life After Death - A new glimpse of life after returning from a near death experience. Magsat -A NASA Magnetic Field Satellite, also known as AEM-3, that was the first designed specifically to investigate the near-Earth magnetic field. Later after detecting a gravity Anomaly (Kentucky Vortex) and naming it the "Kentucky Body" all the information to the public stopped. -Suppressing or mentally satisfying the need for water, food, or sleep. There is some debate over whether this is actually a psychic ability since many of those who are associated with this trait (monks, yogis, mystics, etc...) are not generally called "psychics". - Symbolic, archetypal, and mysterious; believer in extra sensory perception, lives an experimental life, more abstract than logical, a trauma survivor, looks for hidden meaning, different, unpredictable, more solitary, drawn to artistic and cutting edge industries, prefers autonomy, charmer and insightful. - Experiences of people after they have been pronounced clinically dead, or been very close to death. Orb - A spherical shaped, translucent mass of energy resembling a ball or globe of light. Orbs have many names including globes, globules, balls of light, and hovering round balls. They appear in all ranges of brightness from bright-&-glowing to faded-&-barely-visible. They are usually quite fast and follow an erratic pattern of flight. Orbs are believed to be the spirits of the dead by many. However, other theories suggest that they might be separate life forms or even nature spirits. If you beleive your orb photo is real then "your the expert" don't waste your time getting it approved by a non-beleiving so called para-expert. Outward Manifestation -The physical manifestation of paranormal activity. Paranormal Museum- A Spirit can be attached to an object that is familiar to the spirit, and may have been important to the spirit when the spirit was in extraterrestrial or human form. One such paranormal artifact with a know history thousands of years old can be found in the Paranormal museum at www.zteck.com/alien/museum.htm and more detail information at www.zteck.com/alien/bible_secrets.htm that seem to defy that which is alongside of or beside normal scientific explanation. Poltergeist - "Noisy or mischievous ghost." A destructive spirit that has the ability to move objects by solidifying the ambient air which results in the movement and/or teleportation of objects. Psychic Attack - An attack that can either be physical or mental by a reptoid with a brain that has a direct link to an ancient part of our human brain known as the reptilian brain. It's a obvious remnant of our reptilian genetic history. Most people have no idea of the reptoid heritage of the human body and its influence on our behaviour originates from a "mammal like reptile" that was once found all over the world million years ago. -Also known as "object reading", psychometry enables a psychic to pick up on psychic impressions (vibrations) left on an object by someone connected with it. Someone with this ability could use an unfamiliar object to reveal much about its owner. -The ability to start fires with one's mind. - The belief that some aspect of a person's being survives death and can be reborn in a new body at some future date. - Believed to be a psychic imprint of a scene that keeps repeating itself. With this type of haunting no interaction with the ghost occur. Retroactive Psycho Kinesis -Paranormal knowledge of past events. -A artificial alien biological machine Lifeform called a self Replicator that was covered from head to toe with strange, symbolic designs, very ornate, very detailed, very bizarre. There isn't a single square inch of its body that wasn't covered in some sort of strange, iridescent alien symbols. The only known Real live photos of this Predator capable of cloaking, and carrying futuristic weapons from another world was taken above the Sloans Valley Cave in Kentucky. Reptilian Humanoid -a proposed race of intelligent, supernatural, or highly developed reptile-like humanoids in mythology, conspiracy theories. The same as Reptoid can be found all over the earth. Several recent siteings have place then in the far western Appalachian mountains in southern Kentucky. Reptoid -Reptoids a Reptilian-Humanoid beings, cryptid beings, dinosauroids, other names used lizardfolk, lizardmen, Draconians, Saurians and Sauroids... Found Unusual pair of 310 million year old petrified feet millions of years old, before the Dinosaur ever walked the earth they stood a walking upright reptoid or a tall Reptilian humanoid. This almost perfect pair of petrified five toed feet with joints clearly visible, no claws visible. The big feet,large toe, the other four toes and the heel are all human like..This is much larger than any other known reptoid at that time, like the famous Bipedal Reptile Eudibamus Cursoris fossilized with very tiny tracks that were found near here on a slab of sandstone purchased from the Day Ridge Quarry which operated alongside the nevelsville road in McCreary county west of the natural Arch scenic area, the quarry is closed now.. Most people have no idea of the reptoid heritage of the human body and its influence on our behaviour originates from a "mammal like reptile" that was once found all over the world. DNA probes the past for a human bloodline from the Bipedal Reptile Eudibamus Cursoris a 300 million year reptile that isn't a direct ancestor to later reptiles nor is it related to the dinosaurs. Bipiedal reptile With a posture similar to human beings, its hands had five fingers and its arms are shorter than its legs with five toed feet, as in humans it walked on two long legs and ran on its toes. The sandstone slab with the large fossilized human like feet was found near Sloans Valley Cave System, Kentucky...Recent sightings in southern Kentucky.. One face to face Reptoid encounter capture on photo, the Reptoid was armed with a weapon in each hand as it cloaked. Some have been seen under Earth's surface or near entrances to underground tunnels, caverns, cave systems and UFO encounters. Shadow People - Shadow people are a supernatural phenomenon seen as a dark form at the edge of a field of vision that disintegrates, or moves between walls, within a split second. Shadow people have no human featues and never trys to communicate. Shadow people will attacked you and have carried weapons they will lingering for several seconds before disappearing. SLOANS VALLEY CAVE -One of the largest cave systems in the world located a few miles south of Burnside, Kentucky USA former commerical name Cumberland Crystal Cave and now its name is Sloans Valley Cave. Traces of reptoid found dating 10,000 BC at some of the Six major cave entrance's (Over 16 entrances known and new ones being found). Around the surrounding area 300 million year old artifacts have been recover pointing to alien reptilian humanoid spaceman living here millions of years before man. Strange reptoid petroglyph and hieroglyphic messages found around the cave system. A recent sighting and photos captured of an armed unknown live creature above the cave complex seems to be one of the following, Gargoyle, Reptoid, Reptilian, or a extraterrestrial. Tarshish Gemstone - Tarshish, which is a possible Alien gemstone, This spectacular gemstone has no fewer than three names: Faridat meaning 'gem'. Small crystallites of tarshish are found in iron-nickel meteorites called pallasites. The vivid green yellow of the tarshish, with just a slight hint of gold, is a very old gemstone, It is so ancient that it can be found in Egyptian jewellery from the early 2nd millennium B.C and Worn by the ancient Egyptian high priest for protection.. The ancient Romans too were fond of this gemstone and esteemed its radiant green silky shine with the slight tinge of gold particularly rare and precious, which does not change even in artificial light. For that reason they nicknamed it the 'emerald of the evening'. Tarshish is also found in Europe in medieval churches, where it adorns many a treasure, for example one of the shrines in Cologne Cathedral. The warm gold of the tarshish gemstone illuminated Noah's Ark! Tarshish have been known to Man for thousands of years. Noah, it is said, used a tarshish gemstone to help him steer his ark through the dark night. Tarshish meteorites are also found in jewellery from early Egyptian, Greek and Roman times. Many an early explorer and traveller liked to carry a tarshish with him as a talisman and protective stone, as it was believed to light up the night and protect its bearer from evil and disaster. Today, science has taught us that the tarshish proverbial luminosity has healing power!!! Tarshish in the distant past was used at one time to cause its wearer to become invisible. The tarshish gemstone was mounted on the Holy Ark of the Covenant, also the priest in charge wore a tarshish gemstone for protection. UFO SIGHTINGS - Unidentified flying object commonly abbreviated as UFO or U.F.O. is the popular term for any aerial phenomenon whose cause cannot be easily or immediately identified. UFO reports became frequent after the first widely publicized U.S. sighting in 1947, that gave rise to the popular terms flying saucer and then UFO's later. Since then, millions of people have reported that they have seen UFOs. Historical reports seem to defy explanation, but whatever their actual cause, such sightings throughout history were often treated as supernatural portents, angels, or other religious omens. UV CAMERA - The energy of a ghost is not seen in visible light, but lies instead in the invisible worlds of infrared (IR) and the ultraviolet (UV) spectrums. High powered UV cameras are very expense, but simple lens mods can be done on just about any camera that will detect strong ultraviolet. Vortex - This is a swirling funnel shape when in motion. They can also appear long and narrow and having a tread like design. Some theorize this is a vehicle to transport spirits in the shape of orbs from their realm to ours. White Noise - A hiss-like sound, formed by combining all audible frequencies. X-RAY VISION - The ability to see through layers of objects at the discretion of the holder of this modified electronic CCD camera with its "x-ray properties" being secret. This has nothing to do with actual X-rays, since color is a matter of spectral properties at optical frequencies. The ability to see into people's bodies, diagnose medical, to see hidden recesses in walls, spirits and the supernature at are outside the normal, and infrared vision ultraviolet spectrums. Take A look at some of these strange pictures,Ghosts or fake hoaxed pictures to gain media attention? You decide!